This is the link to the Self Help Center for Minnesota District Court. Click this link to see the dozens of topics covered. Click the box with your topic. Read the brief information and AGAIN click on the topic to get to the forms that you can print out, fill-out and then file with the Court. There is enough information on the site to keep you reading for many hours. Also look below to the “St. Louis County Law Library Information” section. I can review self-help forms for my clients at a fair price. Other lawyers also can review forms for you, so please try to get legal advice before you file papers yourself. You risk losing time, money, and sleep later by submitting forms that are done cheaply but are not done right. I offer a free consultation and am located about a block from the Virginia Courthouse, so make an appointment and stop by on your way to file your papers. This link is specifically to the probate section of the above link. Look for the “FORMS” tab to find the forms. AT THIS SITE ARE FREE POWER OF ATTORNEY FORMS AND HEALTH CARE DIRECTIVES. An Estate Claim Form for when an Estate/deceased-person owes you money. An Affidavit to open a Safe Deposit Box at the Bank if the box-owner has died. An Affidavit to collect an amount under $75,000 if that's all the value owned by the deceased person. If the deceased person owned more than $75,000, then you probably need to have a probate. If the deceased owned an asset that automatically passed to a living person (due to joint ownership, beneficiary designation, POD, or other written contract arrangement), then the value of that asset usually doesn't count toward the $75,000 limit. Those assets don't count because the deceased person theoretically doesn't own them anymore after death (ownership changes automatically), but part of a probate process is to check whether this is what the deceased person meant to have happen. As of 2011, Petition for Probate forms are available for Ramsey County, and those forms can be modified to work here in St. Louis County. The link to these forms is on the Self-Help Center site. Also, I can email the forms to you if you want to fill them out yourself. Probate is like riding a bicycle, it’s not easy the first time. 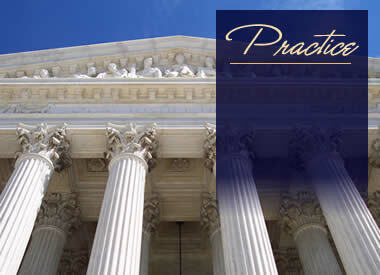 As an attorney, I make my living handling probates, and I do have valuable insight as to how the process works. But I am also a do-it-yourself type of person who would want to avoid the expense of legal fees if I were a client. These free internet forms are part of the new reality of practicing law, and I’m going to work with them as needed to help my clients to get the job done. I have a written fee estimate for a Probate, with the time/cost per task, and it is the same estimate for every Estate, with certain tasks like the Final Account being a range of time depending on complexity. When I have Estate Planning clients, I help them avoid probate by using “Payable on Death,” “Transfer on Death” and other designations on their assets. You can do your own judgment searches, criminal records searches, etc. and you can check the Court Calendar. Available online since 2007, you can search someone's background for judgments (court-ordered debts), civil actions and criminal records. At mncourts.gov, click "Access to Trial Records" at the top of the page and read through the instructions and agreement (it sends you to http://pa.courts.state.mn.us/default.aspx). If you click that you agree with the rules, then you will be presented with a simple page that already has "All MNCIS Sites - Case Search" in the box. Keep that entry and search records throughout Minnesota. You could change this entry to a more specific area, but it's usually better to seek more information. Also, within St. Louis County we have three courthouses with separate data bases, and it is easier to search all available data in the state than to run three separate searches for just our county. Under the "All MNCIS Sites - Case search" are the selections for Judgment, Civil and Criminal searches. To research someone you would run each of these selections. The first input-box is "Search by:" and it starts at "case", but you can click the arrow in the box and change the search to "Defendant" and then fill in the next two boxes with a Last and First name and click "Search." If the name is common to more than one person, you will want a middle name or birth date to identify your person. Sometimes, after searching the name, you can recognize your person in the list, gather the middle name or birth date from the entry, and search again to get just what you want. To view the Court Calendar for the current week, first click on the specific courthouse on the left-side of the page, then click on "Calendar" in the box on the right-side of the page (NOT the one along the top). Each judge has a separate calendar, so if you don't know which judge has your case, you need to look at the calendar for each one. In Virginia, Judge Aronson has most of the Family Law cases and Probate cases, Aronson rarely handles criminal cases (if at all) or conciliation court matters, so look first to Judge Pagliacetti or Judge Florey for criminal and conciliation court cases in Virginia. In Hibbing, Judge Ackerson has most of the Probate cases. The calendars are only for one week at a time and as you scroll through them keep track of the date as it is only stated above the first entry of the day and there can be over 100 entries for a Judge in a day. Sometimes cases are listed that should not be on the calendar, and sometimes cases can be heard that weren't on this official calendar. The term “CRIM/TRAF” means criminal and/or traffic violations. Public website of Minnesota Statutes. You can either check the index for laws by topic, or type in the Statute number to find an exact law. If you do not know an exact Statute number (with the dot, example: "12.34"), then click on "Statutes" at the the left-hand side of the page for the index. Some examples of laws are: Domestic Relations (aka "family law") is mostly in Chapters 517, 518 and 519. The Best Interests of the Child for determining parental custody are defined in Minn. Stat. 518.17. More laws on child custody are in Chapter 257, 257A, 257B and 257C. "Grandparents' Rights" are discussed in Minn. Stat. 257C.08. The Uniform Probate rules are in Chapter 524, with multi-party bank accounts specifically discussed in Section 524.6, and the rights of creditors to those multi-party bank accounts discussed in Minn. Stat. 524.6-207. Also at this site is a link called "Who represents me?" this networks with other legislative site links where you can find your voting district, state representatives and polling place. Free information on hundreds of topics, with publications that they mail to you for free. Online complaint forms for you to report scams, bad businesses, etc. This site contains summaries on Standards for Care of Dogs and Cats, and for other animals. This site has a link to the “Pet Lemon Law” statute and other animal related regulations. NEW IN APRIL 2011: Access Google Earth through this site and get an “artistic rendering” of the deed-lines on the aerial photos. If you click on the land-parcel the property tax information pops up. After about a minute to download, you can search by address, or just zoom-in and find the right parcels by following the roads and rivers. This is amazing. The County site also has a list of openings for jobs in the County, contact information for the various County offices, and travel information. Zoning maps and wetlands maps are posted, which leads me to note: just because a parcel of real estate is “zoned” as “buildable” does NOT mean you can build a septic system on it, that is a separate issue. There is a process to determine whether someone can build a septic on a parcel of land that basically involves a certified septic contractor to go look at the land and draft a plan/design for a septic system, on that specific parcel, with a plan that passes County approval. This is live on the County website as of May 8, 2013. Anyone can use it to find locations within St. Louis County. In addition to law library information, this website page lists several of the same links that I have here, and a few more that you may find helpful. There is a “real” Law Library in each Courthouse, with updated law books and with computers for free online access to legal research and forms. Each courthouse has a computer with a phone next to it for calling the Self Help Center staff for help in looking for online legal forms and information. There is a law librarian available on Wednesdays at the Virginia Law Library. If you are in Duluth, check out the fifth floor law library, it is gorgeous and has a commanding view of Lake Superior. There is talk of moving the Duluth law library, so see it while you can. Please note: Parent A is the obligor who pays the support. Parent B is the obligee who gets the child support. If these are input backwards the calculator won't work. If dad pays child support, dad is Parent A. The case # in 3 and 4 can be left blank but all other boxes need a positive number or a zero. "Income" is gross income (no deductions for taxes or anything). "Potential income" is how much more a parent should be earning if they worked full time, worked at a job like their former (better) job, or worked at a (better) job they reasonably could have. This works both ways. Even a stay-at-home mom with young children may have to input for 40 hours per week of potential earnings (sometimes even if the income won't cover the cost of daycare, but every case is different.) To print, click the "printable version" command near the top of the page and then click print. The Political Graveyard is a web site about U.S. political history and cemeteries. The link is to the list of politicians who lived in St. Louis County. If you are starting a business, go to: http://www.positivelyminnesota.com/Business/index.aspx within this site you may obtain a free information guide and all kinds of info on loans, employment issues, etc. Free forms to incorporate your business! When deciding whether to incorporate as a Limited Liability Corporation (LLC), Sub S corporation, or other entity, consult your accountant. Your accountant will have good information on your financial situation to help you pick the right tax-entity. Deciding on which entity is up to you or your lawyer. In general, "incorporating" means liability protection, and any lawyer can tell you that reducing your liability is a good idea. Creating the corporate entity is easy, making your business operate within the rules of the corporate entity (so that it really is a corporation) is less easy. This IRS website allows you to apply for an Employer Identification Number. It takes about two minutes to apply and you get your number immediately online. You can research the competition, economic situation, market trends and other critical business data at the Business Source Premier. This site is for advanced business development research. It might not make sense until you are ready for a marketing strategy. You should also go to the Arrowhead Library link at: http://www.arrowhead.lib.mn.us and click on their "Services for Library Patrons" and then click on the "Magazines, Newspapers and Other Databases." This is both a gold mine of information and a good way to spend hours and hours of time online. Iron Range Resources and Rehabilitation (IRRRB, usually called "the I triple-R B") http://mn.gov/irrrb/ This organization has loans and grants. I access the Multiple Listing Service through www.vermilionland.com or www.culbertrealty.com. These websites are nicely designed to bring up Iron Range listings. I like Vermilion Land Office realtors (Steve, Donna, Don, Karl, et al) especially for listings north of Virginia to Cook, Tower, Babbit, Ely; and I like Molly Poole and the Culberts at Culbert realtors for Quad Cities listings (Virginia, Eveleth, Gilbert, Mt. Iron). I also like Mike Lolling and Mr. and Mrs. Edwards at Century 21. This is the FREE site. I like the Experian reports better than the other two. The "freeannualcreditreport.com" site is a bait-and-switch site that is full of ways to "accidentally" misclick and get charged. The actual free site is also full of ways to misclick: if you are asked for your credit card number, cancel and start over. Read carefully, look for the gray box at the bottom of the page, click-to-check the tiny-little box to agree with the terms and conditions BEFORE you click the "Next" button (or it will send you to the page to get your report by post-office mail.) If you misclick, you have to start at the beginning, and you should then pick a different company for your report. If you misclick three times (once with each company), you may have to agree to get your report by mail. Meet the residents of Cook, Minnesota. For travel information, you should check out the State Department web site. What are Family Care Agreements? Can you answer a quick question? An Ethical Will is your spiritual legacy, your memories, your wisdom and guidance passed on to posterity. When your heirs read your Ethical Will (either as a separate document, as a recording, or as part of your Will), they will come to know you and your thoughts. Having a message from you can be more meaningful than money. If you had a letter that your great-grandparent wrote, would you read it? What sort of things would be most meaningful for you to know about that person? Now think of how you could write a letter about yourself, your experiences in life, your advice, and your heritage (what do you remember about your grandparents?) to leave for future generations to read, or for them to watch if you chose to make a videotape. I take pleasure in providing this service, and the flat fee is the same for a Will or an Ethical Will. I offer this non-legal service because it flows naturally out of the legal will-writing process. In general, without any Will, a deceased person's Spouse is entitled to everything (after paying off debts, with a homestead exemption.) However, if the Spouse's name is not on the title to real estate, vehicles or other property, then the property must go through Probate to get the Spouse's name on the title. Probate costs more than creating a deed to change the title. For people (typically young people) who do not have a spouse and who do not have children, the assets pass to their legal parents (half to the mother, half to the father, or all to the surviving parent). When a decedent leaves children but no spouse, the law grants everything in equal shares to the decedent's natural and/or adopted children "per stirpes" - and right about there is where grandchildren, "degrees of relation," etc, complicate the explanation. Apart from State Law legalities, when there is no Will to clearly explain a decedent's wishes, certain people seem to think of the un-bequeathed Estate as "ownerless" and they take what they want. I believe that people are less likely to steal and argue over property when there is a Will to guide them in the distribution of assets. One last point to mention: the State of Minnesota gets the assets of a decedent resident if no legal relative comes forward to claim the assets. There are plenty of other worthy charities, from churches to schools to animal shelters which would be far more honored to receive a legacy of any size. If you have no family and want to leave your Estate to your favorite charity but you can't afford to pay much for a Will, I can offer you a discount, just ask. An Estate Plan involves both having a Will and checking all the "paperwork" such as deeds, titles, bank accounts, life insurance and other financial assets - because many assets have, in their "paperwork," a sort-of "mini-will" that directs who gets the asset if the owner passes away. Simply writing a Will might cause confusion if the Will conflicts with the "mini-wills." An Estate Plan coordinates everything to eliminate confusion and minimize costs (such as estate taxes and probate). Another benefit of the Estate Plan is information. Once you can "see" your assets altogether, it becomes easier to manage them to benefit yourself. How much do you need to save for your retirement plan? Should you have nursing home insurance, or disability income insurance, or more or less life insurance? I do not sell any financial products nor direct my clients to any insurance agent. I can set up the framework for you to make decisions. The term "Living Will" has been replaced by the term "Health Care Directive." Having a simple Living Will that states your wishes regarding whether or not you want to be kept on artificial life support is insufficient. Doctors and lawyers feel safer following the orders of a real person more so than following (and therefore being responsible for) the directives of a written document, especially on matters of life and death. Therefore, it is necessary to have a Health Care Directive, also called a Power of Attorney for Health Care. This gives one or more persons of your choosing the power to make your health care decisions when you cannot do so yourself. If one family member is providing all or most of the care for another adult, then any agreement for payment should be in writing. This writing is a Contract called a Family Care Agreement. The adult receiving the services agrees on how much the caregiver will be paid. As awkward as it is for a caregiver to ask an elderly mom or dad for compensation, it brings out the truth of whether or not the caregiver will be paid. Some parents assume that the care is free and proceed to grant their estate equally to all their children. Some caregivers assume that they will be paid after the parent passes away by inheriting the entire estate. Medical Assistance can “pull back” money from a family member, claiming it was a gift, if the family cannot prove that the payment was for care services. The agreement can be one page: names, hourly wage, expected hours per day to be worked, tasks to be completed, signed and dated. In August of 2008, Minnesota law changed to allow us to use a Transfer on Death Deed (TODD). This deed is a “mini-will” that covers just the real estate described in the TODD, and it grants ownership of the real estate ONLY upon the death of the grantor(s). The good thing about using a TODD is that the real estate will avoid probate, AND the TODD can be revoked by the grantor for any reason, the real estate can be sold WITHOUT needing extra signatures, and it does NOT matter if the grantees (usually the grantor’s children) have issues (divorce, bankruptcy, lawsuit judgments), because they have no interest in the real estate under the TODD until after the grantor(s) death. A Life Estate Deed also avoids probate, it also can preserve some of the value of the real estate to the grantees. But the only way to revoke a Life Estate Deed is with the notarized signatures of all the grantees and their spouses, the only way to sell is with the notarized signatures the all the grantees and their spouses, and the issue of the value of the real estate is “on the table” if the grantees get divorced, file bankruptcy, or owe money under a judgment. I keep my office in Virginia, MN. This allows me to serve clients in the vast Iron Range territory. I cover the counties of Aitkin, Cook, Itasca, Koochiching, Lake, and Saint Louis County. 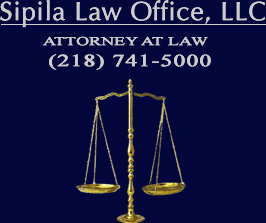 I serve clients from Orr to Duluth, down to Pine City, and over to Hill Lake Township. Maybe. 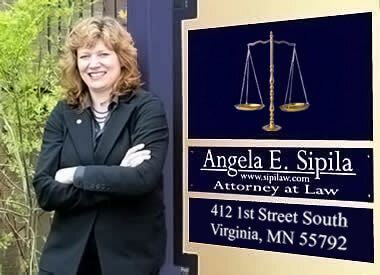 If you want to trust the privacy of the Internet, which IS NOT up to the standards of attorney-client confidentiality, feel free to send me a short email message at ange@sipilaw.com . Do not send any information that you must keep confidential, email is not sufficiently secure for such communications. The act of sending me an email does not make me your lawyer. My answering your email might make me your lawyer, we'll see. I am not allowed to publicly post my fees, but if you ask (by email), I can tell you my hourly rate, I can state my flat fees for a Will, Purchase Agreement, Easement or Deed, and/or I can send my standard fee estimate for a Probate or a Divorce. I must say that if you are concerned about your rights in a legal matter, DON'T DELAY - get off the Internet and call an attorney to discuss it. Some claims expire if you wait too long to raise them. So don't wait. Thank you for reading my website. Your e-mail comments are welcome. Disclaimer: If you rely on anything herein, and suffer damages therefrom, I am not liable herewith. Meet the attorney and staff. Free websites for legal issues. Answers to common legal questions.